Dennis Aabo Sorensen tests a prosthetic arm with sensory feedback in a laboratory in Rome in March 2013. Doctors had to amputate what remained of his left hand. Since then Sorensen has been getting by with a standard prosthetic hand, which simply opens and closes so he can do basic things. "When I'm at the grocery store I can carry a bag and all that," says Sorensen, who's now 36 years old. "But the biggest issue is, of course, that I have to look at it all the time to see that it's doing what I want it to do." With a standard prosthetic, Sorensen can't feel anything he's holding or touching. So when he heard about an experimental prosthetic that would let him feel again, he jumped at the chance to try it. "First of all I was thinking, this, this can't be true," he says. But it was, and Sorensen traveled to Rome to become the first person to try it. "The goal of our project was to provide sensory information to an amputee in real time in order to increase the usability of the prosthesis--to give back as much as possible natural sensory information," says Silvestro Micera, director of the Translational Neural Engineering Laboratory at the Ecole Polytechnique Federale de Lausanne in Switzerland, who helped develop the prosthesis. The researchers added sensors to each finger of the hand. Surgeons then inserted tiny electrodes into Sorensen's arm that connected the sensors to nerves in his arm. "These are the nerves which connect the hand to the brain," Micera says. "They are the natural ones conveying the sensory information from our natural sensors in the fingers in the hand back up to the brain." Almost immediately, Sorensen was able to feel all kinds of things. "It was really, really amazing because suddenly my artificial hand and my brain were working together for the first time in many years," Sorensen says. "It was very close to be like your normal hand." Even when he was blindfolded and wearing ear plugs, Sorensen could tell the difference between a Mandarin orange and a baseball, between a short bottle and a tall bottle and even between a hard wooden block and a piece of soft fabric. "I squeezed that the first time, then I could just feel a tiny little vibration in my fingers and then I was sure that this one was a soft object. Yeah, it's a very amazing device to use," he says. Sorensen spent weeks in 2013 testing the device and showing that he could easily control the strength of his grasp. "It was incredible to see that the more we were trying something new the more Dennis was able to achieve it quickly and easily," Micera says. "It's the first time that somebody's been able to achieve this kind of richness in the sensory feeling." The experiment was reported Wednesday in Science Translational Medicine. Some researchers are being cautious about the report. "It demonstrates a proof of concept, but whether this is useful in ultimate clinical application is still remain to be seen," says Daofen Chen, a program director in cognitive neuroscience at the National Institutes of Health. Chen wonders if amputees would be willing to undergo hours of surgery to have electrodes surgically implanted in their arms. And the device is currently too bulky to be used in everyday life. But others are more enthusiastic. "I believe that when you add sensation, that prosthesis changes from a tool that they're using at the end of their limb to their hand," says Dustin Tyler, an associate professor of biomedical engineering at Case Western Reserve University. "And if that's what they get back, I believe in that case it would be worth the implant." Micera acknowledges that there's a lot more work that needs to be done before the hand could be made widely available. But he hopes to start testing a portable version on volunteers in a few years. An international team of researchers reports they've created a prosthetic hand that allows amputees to feel what they're touching. In a paper in the journal Science Translational Medicine, they describe the results of the first test of this bionic hand on a Danish man. NPR's Rob Stein reports. ROB STEIN, BYLINE: Ten years ago, Dennis Sorensen was setting off fireworks to celebrate New Year's Eve with his family in Denmark when something terrible happened. DENNIS SORENSEN: Unfortunately one of the rockets we had this evening was not good and when we light it, then it just blew up and then, yeah, my hand was not that good anymore. STEIN: Doctors had to amputate what remained of his left hand. Since then, he's been getting by with a standard prosthetic hand, which simply opens and closes so he can do basic things. SORENSEN: When I'm at the grocery story I can carry a bag and all that. But the biggest issue is, of course, that I have to look at it all the time to see that it's doing what I want it to do. STEIN: He has to look because he can't feel anything he's holding or touching. So when he heard about a new hand - a hand that would let him actually feel again - he jumped at the chance to try it. SORENSEN: First of all I was thinking: This can't be true. STEIN: But it was. And Sorensen traveled to Rome to become the first person to try it. 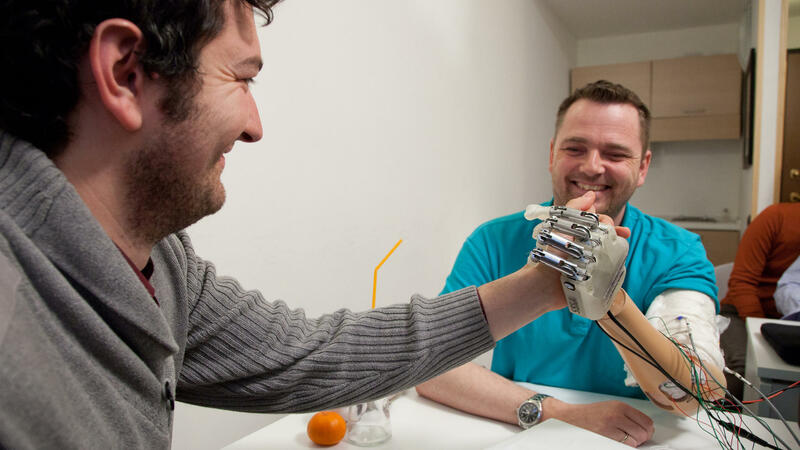 That's where he met Silvestro Micera, a biomedical engineer who helped create the new bionic hand. SILVESTRO MICERA: The goal of our project was to provide sensory information to an amputee, in real time, in order to increase the usability of the prosthesis; to give back as much as possible natural sensory information. STEIN: So the researchers added sensors to each finger of the hand. Surgeons then inserted tiny electrodes into Sorenson's arm that connected the sensors to nerves in his arm. MICERA: These are the nerves which connect the hand to the brain. They are the ones conveying the sensory information from our natural sensors in the fingers in the hand back up to the brain. STEIN: Almost immediately, Sorensen was able to feel all kinds of things. SORENSEN: It was really, really amazing because suddenly my artificial hand and my brain was working together for the first time in many years. So yeah, it was very close to be like your normal hand. STEIN: Even when he was blindfolded and wearing ear plugs, Sorensen could tell the difference between a mandarin orange and a baseball, between a short bottle and a tall bottle, even between a hard wooden block and a piece of soft fabric. SORENSEN: I squeezed that the first time then I could just feel a tiny little vibration in my fingers. And then I was sure that this one was a soft object. Yeah, it's a very amazing device to use. STEIN: Sorensen spent weeks in Rome testing the device and showing he could easily control the strength of his grasp. Micera says the results were very encouraging. MICERA: It was incredible to see that the more we were trying something new, the more Dennis was able to achieve it quickly and easily. It's the first time that somebody is able to achieve this kind of richness in the sensory feeling. STEIN: Some other experts are being cautious about the report. Daofen Chen, of the National Institutes of Health, doubts many amputees would be willing to undergo hours of surgery to have electrodes surgically implanted in their arms. DAOFEN CHEN: It demonstrates a proof of concept. But whether this is useful in ultimate clinical application is still remain to be seen. STEIN: But others were more enthusiastic. Dustin Tyler studies prosthetics at Case Western Reserve University. DUSTIN TYLER: I believe that when you add sensation that prosthesis changes from a tool that they're using at the end of their limb to their hand. And if that's what they get back, I believe in that case it would be worth the implant. STEIN: Sorensen says he'd jump at the chance to be able to use the device permanently and not just in a research experiment. SORENSEN: ...that's not up to me to decide. STEIN: Micera acknowledges that there's a lot more work that needs to be done before the hand could be made widely available. But he hopes to start testing a portable version on volunteers in a few years.